The taste of home cooking, without all the fuss! You'll love these boneless, center cut, juicy pork chops. Each pork chop is hand-trimmed to perfection. Add our gourmet seasoning and you've got the perfect chop! This hearty meal is complete with Stuffed-Baked Potatoes and Vegetable Medley. Meal serves 4. Thaw in refrigerator.�Grill: Preheat grill. Remove pork chops from package. Pat dry, season as desired and cook over medium heat for approximately 4-7 minutes per side until internal temperature reached 145 �F.�Broil: Preheat broiler. Remove pork chops from package. Pat dry, season as desired. Place on broiler pan 3-4 inches from heat source. Broil 4-7 minutes per side until internal temperature reaches 145 �F.�Contact Grill: Preheat contact grill. Season thawed pork chops. Grill 4-5 minutes for a 4 oz. chop; 5-6 minutes for a 5 oz. chop; 6-7 minutes for a 6 oz. 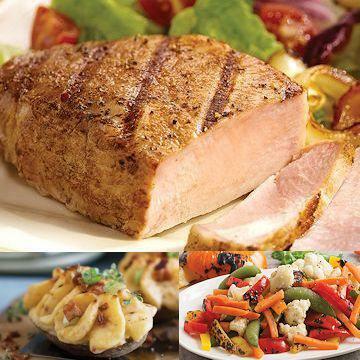 chop.�Beef, Pork, Lamb, Veal and Poultry have been born, raised and harvested in the USA. Bake: Preheat oven to 350� F. Remove potato from package. Place desired number of frozen portions on an ungreased baking sheet. Bake 40 minutes, until heated through and lightly browned.�Grill: Preheat grill. Remove potato from cellophane package. Place frozen potatoes on a sheet of aluminum foil. Wrapping foil around potatoes, leaving top half exposed. Grill on medium-high heat. Cook with grill lid down for 35 to 45 minutes.�Microwave: Remove potato from wrap. Place one frozen potato on microwave safe dish. Cook on high for 21/2 to 4 minutes rotating at half way point. To cook two potatoes, increase cooking time to 4 to 6 minutes. Do Not Thaw!�Microwave: Cut slit in center of film. Place tray in microwave; cook on high for 2-3 minutes. Carefully remove film, stir and cook on high for 1-2 minutes or until internal temperature reaches 165�F. Stir and serve.�Oven: Preheat oven to 350�F. Carefully remove film from tray before baking. Place tray on baking sheet on oven center rack. Bake for 35-40 minutes or until internal temperature reaches 165�F. Remove from oven, stir and serve.